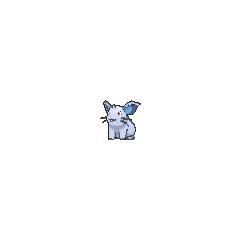 Nidoran_F in game: 4,052 Who? Important notice! Pokemon Nidoran_F is a fictional character of humans. She evolves into Nidorina starting at level 16, which evolves into Nidoqueen when exposed to a Moon Stone. She is related to the Nidoran♂ line, and can produce Eggs that contain either Nidoran♀ or Nidoran♂. 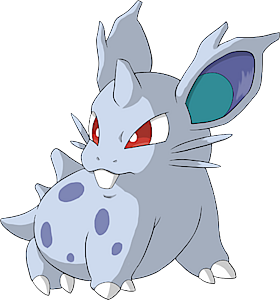 However, she is the only one of her line that can breed, as Nidorina and Nidoqueen are part of the Undiscovered Egg Group. A romance between a male and a female Nidoran was the focus of Wherefore Art Thou, Pokémon?. After the battle with Team Rocket, and after kissing Ralph's Nidoran♂, Emily's Nidoran♀ evolved into a Nidorina. Nidoran♀'s debut was in Sparks Fly for Magnemite as a sick Pokémon at a Pokémon Center. A group of Nidoran♀ were seen at Professor Oak's Laboratory in Showdown at the Po-ké Corral. These Nidoran♀ were colored the same way as Shiny Nidoran♀, but they predated their appearance. A differently patterned Nidoran♀ appeared in Poké Ball Peril. Nidoran♀ also appeared in The Power of One. 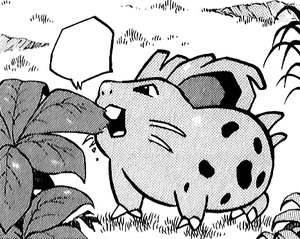 Team Rocket attempted to capture a pink Nidoran♀ and its male counterpart during the events of In the Pink, but ended up being chased off by a pink Nidoking. A Nidoran couple briefly appeared in The Chikorita Rescue. A Nidoran♀, along with a Nidoran♂, briefly appeared in Going Apricorn! at Professor Oak's Laboratory being fed by Tracey. A Nidoran♀ was one of the Pokémon stolen by Butch and Cassidy in The Fortune Hunters. 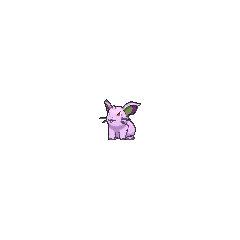 Nidoran♀ also appeared in Celebi: Voice of the Forest. A Nidoran couple were among the inhabitants of the Dragon Holy Land in Fangs for Nothin'. Several Nidoran♀ appeared in the following episode in the same location. A Nidoran♀ was used by one of the students of the Pokémon Trainer's School in Gonna Rule The School!. A Nidoran♀ was one of the Pokémon seen at Professor Oak's Laboratory in Showdown at the Oak Corral. Multiple Nidoran♀ appeared in the opening of Destiny Deoxys. Nidoran♀ appeared in Lucario and the Mystery of Mew living in the Tree of Beginning. Nidoran♀ also appeared in Pokémon Ranger and the Kidnapped Riolu! Part One. A group of Nidoran♀ appeared in Leading a Stray!. Nidoran♀ appeared in the book Bonnie was reading in The Clumsy Crier Quiets the Chaos!. A Trainer's Nidoran♀ appeared in Alola to New Adventure!, during a flashback. A Nidoran♀ appeared in SM003, as a silhouette. Another Nidoran♀ appeared in File 3: Giovanni at Silph Co.
Green had a Nidoran♀ nicknamed Nido in Pokémon Adventures, which first appeared in Just a Spearow Carrier, she was never seen battling until she evolved into Nidorina and then Nidoqueen. In Indigo Plateau, Green's Nidoran♀ was used to attract a fisherman's Nidoran♂ and to help persuade the fisherman to trade his Butterfree for Green's Weedle; she was stopped by Red. A Nidoran♀ appears in the Safari Zone as one of the inhabitants there. 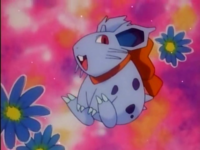 Nidoran were the first Pokémon to feature gender, and even gender differences; however, their differences are much greater than those of most later Pokémon. Nidoran♀ and its evolution share their category with their male counterparts Nidoran♂ and Nidorino. They are all known as the Poison Pin Pokémon. 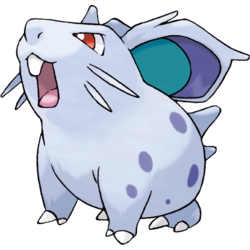 Nidoran♀ appears to be based on a porcupine, rabbit (perhaps an Amami rabbit, specifically), mouse, hamster, or some combination thereof.